This article is about the Portuguese football coach. For the Angolan football coach, see Carlos de Sousa Queirós. For the Portuguese Olympic shooter, see Carlos Queiroz (sport shooter). This name uses Portuguese naming customs. The first or maternal family name is Leal and the second or paternal family name is Queiroz. Carlos Manuel Brito Leal Queiroz, ComIH (Portuguese pronunciation: [ˈkaɾluʃ kɐjˈɾɔʃ]; born 1 March 1953), is a Portuguese football coach who is currently the manager of the Colombia national team. He has served as the manager of his native Portugal's national team on two occasions, the United Arab Emirates, South Africa and Iran, leading South Africa (2002), Portugal (2010) and Iran (2014 and 2018) to the FIFA World Cup. At club level, he has also managed Sporting CP, the New York/New Jersey Metrostars in Major League Soccer and Spanish club Real Madrid. He also had two spells as Alex Ferguson's assistant manager at English club Manchester United. Queiroz has won several awards as a coach in junior levels, and has been successful at senior and club levels, mainly as Alex Ferguson's assistant manager. In 1998, he authored the Q-Report, which detailed plans to enhance footballer development in the United States. Queiroz is the longest-serving manager in the history of the Iran national team, serving for almost eight years between 2011 and 2019. He is the only manager in the country's history to lead the national team to two consecutive World Cups. Born in Nampula, Portuguese Mozambique, to Portuguese parents, Queiroz had an undistinguished professional career as a footballer, playing as a goalkeeper in Mozambique before turning to management. He moved to Portugal following Portugal's Carnation Revolution on 25 April 1974, and Mozambique's declaration of independence in 1975. Queiroz is a graduate of the University of Lisbon. He coached the Portuguese under-20 side to two FIFA World Youth Championship wins, in the 1989 and 1991 tournaments. Based on a Forbes report, his salary as an Iranian team manager was 2,098,060 USD during the 2014 FIFA World Cup. In 1984, Queiroz was appointed as assistant manager of Estoril-Praia. After that, Queiroz was appointed senior national team coach in 1991. He had a record of 14 wins in 31 matches. Afterwards, he went on to manage the Portuguese Primeira Divisão team Sporting CP in 1994. He subsequently coached the NY/NJ MetroStars in the United States and the Japanese team, Nagoya Grampus Eight. In between, he found time to author the Q-Report, detailing plans to professionalize the development of footballers in the United States. Queiroz returned to coaching national teams in 1999, when he took the job as head coach of the United Arab Emirates, before becoming head coach of South Africa in 2000. Under Queiroz, South Africa qualified for the 2002 FIFA World Cup, but Queiroz resigned in March 2002 before the finals after falling out with the South African Football Association. Queiroz was part of FIFA XI coaching staff, alongside Brazilian Carlos Alberto Parreira, in a humanitarian friendly match played in war-torn Sarajevo against Bosnia and Herzegovina on 25 April 2000. Queiroz became a coach at English club Manchester United in June 2002. 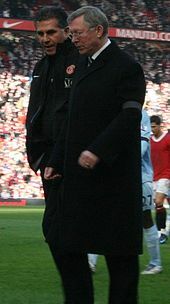 He began his work at the start of the 2002–03 season, working alongside Alex Ferguson, who had gone without an assistant manager since the departure of Steve McClaren in the middle of 2001. Queiroz's position at Manchester United as assistant manager attracted the attention of Real Madrid, who wanted Queiroz as their manager to replace departing manager Vicente del Bosque in the summer of 2003. It was an opportunity to work with FIFA World Player of the Year award winners Zinedine Zidane, Ronaldo and Luís Figo, an opportunity that Queiroz felt unable to turn down. He was appointed on a two-year contract, only a week after the arrival of Manchester United player David Beckham. Real Madrid got off to a good start of the 2003–04 season, defeating Mallorca in the Supercopa de España. By mid-season, the team topped the La Liga table and was in contention for the Copa del Rey and the UEFA Champions League trophies. However, they lost their final five matches and finished in fourth place, with Valencia winning the title. Real Madrid also disappointed in the Copa del Rey and the Champions League, ending the season with the Supercopa de España as the only trophy won. Following ten months at Real Madrid, Queiroz joined the long list of managerial failures at the Santiago Bernabéu Stadium, as he was sacked in May 2004. Reforming the old partnership with Alex Ferguson proved an attractive option to both sides. United had trailed 15 points behind Arsenal, and Ferguson was forced to bring in temporary help from Walter Smith during the tough end of season run-in. Subsequently, Queiroz returned to United as assistant manager on 1 July 2004, signing a three-year deal. Queiroz was rumoured to be one of the main reasons for team captain Roy Keane's departure from Manchester United in November 2005. According to Keane, he did not like the way Queiroz was given so much responsibility as if he were manager of the club and Keane did not like the tactics that Queiroz employed. One of the main outbursts of Keane's MUTV interview was aimed directly at Queiroz. Queiroz was linked with managerial roles with Portuguese side Benfica and the United States national team in 2006 but he remained with Manchester United to help them win the Premier League in 2007. Queiroz was often seen conducting interviews with BBC programmes, such as Match of the Day, as at the time Alex Ferguson refused to speak with the BBC after allegations by the BBC's Panorama programme that Ferguson's younger son Jason, and then Portsmouth manager Harry Redknapp, had been involved in corruption regarding cuts in transfer fees. Some of Queiroz's post-match opinions on refereeing were controversial. For example, in 2008 Queiroz was – unsuccessfully – charged with improper conduct by the Football Association after describing referee Martin Atkinson's performance in a match as "a disgrace". In late March 2008, it was reported that Benfica had, once again, approached Queiroz to become their manager and had made a formal request to Manchester United. United were heavily involved in the 2007–08 Premier League title race, five points clear at the top, with just seven games remaining, and also were still competing in the Champions League – being in the quarter-finals at the time of the enquiry. Queiroz did not make any public response to the approach. Following Benfica's approach, and amid rumors of an opening as the Portugal national coach, Alex Ferguson started to push for Queiroz to be his successor as manager at Old Trafford and discouraged any possible suitors from approaching him. However, rumours over the summer of 2008 continued to link Queiroz with the Portugal national team managers' role, following the departure of Luiz Felipe Scolari. On 11 July 2008, Manchester United agreed to release Queiroz from his contract, and he was appointed manager for the Portuguese national team. On 11 July 2008, it was announced that Queiroz was leaving Manchester United, having agreed to a four-year contract to become the head coach of the Portugal national team. Portugal struggled under his management during the qualification for the 2010 World Cup. Despite kick-starting their World Cup qualification campaign with a comfortable 4–0 win against Malta in Ta' Qali, Queiroz's team failed to win any of their subsequent four matches. Home form was poor, with a 3–2 defeat to Denmark followed by 0–0 draws against Albania and Sweden. Together with another goalless draw in Stockholm against Sweden, these results left Portugal with only six points out of a possible 15 and on the brink of missing a major international tournament for the first time since 1998. Building on an improving reliability in defence, Portugal defeated Albania in Tirana 2–1 with a late goal, tied 1–1 against Denmark on 5 September, beat Hungary 1–0 and again 3–0 in the return match, and finally defeated Malta 4–0. These results, together with a defeat of Sweden to Denmark, enabled Portugal to finish the campaign second in the group with 19 points, one ahead of Sweden, and qualify for the UEFA play-offs. They played Bosnia and Herzegovina in home and away legs. Portugal won 1–0 in Lisbon and followed up with a 1–0 victory in Zenica, and as a result they advanced to the finals of the 2010 World Cup. At the World Cup, Portugal drew 0–0 with the Ivory Coast but then beat North Korea 7–0, the heaviest victory in the World Cup since Germany's 8–0 defeat of Saudi Arabia in 2002. This rout virtually guaranteed Portugal passage to the second round and a second goalless draw with Brazil confirmed qualification. In the second round, they lost to Spain 1–0 and were knocked out having failed to score in three of their four World Cup matches. Queiroz was sacked by the Portuguese Football Federation on 9 September 2010. He was also suspended for six months by the Portuguese Anti-Doping Authority (Autoridade Antidopagem de Portugal) on 30 August. On 23 March 2011, the Court of Arbitration for Sport upheld the appeal of Queiroz. Since Queiroz's role as manager of the Iran national team, he has been renowned for introducing players from the Iranian diaspora to the national squad. These players include German Iranians Daniel Davari and Ashkan Dejagah, Dutch Iranian Reza Ghoochannejhad, Swedish Iranians Omid Nazari and Saman Ghoddos, and Iranian American Steven Beitashour among others. Iran, under Queiroz, began their World Cup qualification campaign successfully, defeating the Maldives 4–0 in the first leg of their second round of qualifiers. After winning 5–0 on aggregate, Iran advanced to the third round of qualifiers, where they were drawn with Indonesia, Qatar and Bahrain. Iran highlighted their position at the top of their group by defeating Bahrain 6–0 at home in the Azadi Stadium, as well as inviting former German youth international, Ashkan Dejagah, who scored twice on his debut against Qatar. After a 4–1 win at Indonesia, Iran qualified for the final round of direct qualifiers, the fourth round. In the fourth round, Iran were drawn with South Korea, Qatar, Uzbekistan, and Lebanon in their group. Queiroz made new foreign-based additions to his squad, adding players such as Reza Ghoochannejhad to his team. Iran started their fourth round of Asian qualifiers with a 1–0 win in Uzbekistan. Team Melli then drew Qatar and lost in Lebanon before defeating South Korea at the Azadi on 16 October with a goal from captain Javad Nekounam. After a 1–0 loss in Tehran against Uzbekistan, Iran defeated Qatar 1–0 in Doha and Lebanon 4–0 at home. In their last qualification match, Iran defeated South Korea 1–0 in Ulsan Munsu with a goal from European-based Ghoochannejhad, resulting in their qualification to the 2014 World Cup as group winners with 16 points. Thus, Iran became the third team that Queiroz managed to qualify for the World Cup, having reached the 2002 edition with South Africa and the 2010 edition with Portugal, leading the latter to a knockout stage finish. Iran qualified for the 2014 World Cup as group winners and competed in Group F alongside Argentina, Nigeria, and Bosnia and Herzegovina. On 1 June 2014, Queiroz announced his 23-man squad. Prior to the tournament, they founded the Central Asian Football Association. In the opening match of the tournament on 16 June, Iran drew Nigeria 0–0, making it their first clean sheet of the FIFA World Cup. In their next match, Iran was defeated by Argentina 1–0 with a late goal from Lionel Messi, and received praise after holding Argentina for 90 minutes while creating some attacking opportunities of their own. Iran was eliminated from the tournament in their next game, a 3–1 defeat to Bosnia and Herzegovina. Iran's lone goal was scored by Reza Ghoochannejhad. After the tournament, Queiroz extended his contract until the 2018 World Cup. Iran continued their winning streak after 2014 World Cup qualification, securing qualification to the 2015 Asian Cup months later as the highest ranked seed. Iran qualified for the 2015 AFC Asian Cup as group winners, where they were the highest ranked seed. Iran faced Bahrain, Qatar, and the United Arab Emirates in Group C.
With the second highest number of fans in the tournament after hosts Australia, the Iranians defeated Bahrain 2–0 with limited preparations. A defensive-minded Iran then defeated Qatar 1–0 thanks to a Sardar Azmoun goal before defeating the UAE by the same scoreline to reach the top of their group. In the quarter-finals, Iran faced underdog Iraq, who they had beaten weeks prior in a friendly match. Having received a controversial red card in the first half from referee Ben Williams, Iran led a valiant effort with ten men, scoring two goals late in extra time to draw the match 3–3. In the ensuing penalty shootout, Iran lost 7–6 in sudden death. Iran began their 2018 World Cup qualification campaign with friendly matches against Chile and Sweden in March 2015. Queiroz resigned from his managerial post thereafter due to disagreements with the Iranian Football Federation. On 14 April 2015, Iran were drawn with Oman, India, Turkmenistan, and Guam in the second round of qualifiers. On 26 April, Queiroz announced that he would continue as the manager of Iran for their 2018 World Cup campaign. Iran ended their second round qualifying with a 4–0 victory against India and a 2–0 win against Oman. Iran finished top of the group with 20 points from eight games, Queiroz and his team managed to avoid defeat and remain unbeaten in the second round of World Cup qualifying. Iran was placed in Pot 1 alongside Australia for the draw of the third round of World Cup qualifying. They drew with South Korea, Uzbekistan, Qatar, China and Syria. With two games remaining, Iran qualified to the World Cup with defeating Uzbekistan at the Azadi Stadium. They became third team to qualify to the World Cup after host Russia and Brazil. In April 2018, he was one of the applicants for the vacant Cameroon national team job. In 23 September 2018, Queiroz extended his contract until the 2019 AFC Asian Cup. With wins over Yemen and Vietnam, and a draw with neighbours Iraq, Iran won Group D and progressed to the round of 16, where they met the third-placed team from Group F, Oman. A 2–0 win over Oman set up a quarter-final against China, whom they beat 3–0. However, in his 100th match in charge of Iran, the semi-final against Japan saw Queiroz's team concede their first goals of the tournament, all in the second half, losing 3–0. After the match, Queiroz announced that he would not be renewing his contract as manager of Iran. On 7 February 2019, Queiroz took over as the new manager of Colombia on a three-year contract. He will be the only European coaching a South American national team, and is the fourth European manager to be in charge of the Colombian team after Friedrich Donnenfeld, Toza Veselinović and Blagoje Vidinić. Prior to the final 2014 World Cup qualification match against South Korea, Queiroz was angered by the comment made from Choi Kang-hee, the head coach of South Korea, who complained that Iran did not provide the training facilities with sufficient qualities during South Korea's away qualification match against Iran on 17 October 2012. Choi stated that South Korea would defeat Iran to help Uzbekistan qualify for the World Cup finals with South Korea, and that Iran would have to watch the World Cup on television. The South Korean team also pledged to "make life painful" for Iran and to force their captain to cry "tears of blood". In response, Queiroz severely criticized Choi in his official comments and by wearing an affronting T-shirt. After Iran's victory against South Korea in their final qualification match, Queiroz showed his anger at the South Korean national coach with a raised fist gesture, which was deemed offensive by the South Korean players and staff, almost causing a fight between the two teams. As a result of the altercations, Sosha Makani was suspended for their opening match of the 2014 World Cup. Queiroz had answered previously to Choi that Iran had fairly shared what they had with the South Korean national team on their visit to Iran. ^ "Portugal's coach is chasing a personal dream". independent.co.uk. London: Independent News and Media. 29 June 2010. Retrieved 3 July 2010. ^ "Carlos Queiroz, player profile". footballzz.co.uk. Retrieved 23 November 2013. ^ "Queiroz joins Man Utd". BBC Sport. 6 June 2002. Retrieved 20 June 2007. ^ "Meet Faculty of Human Kinetics - University of Lisbon". High Performance Football Coaching. Retrieved 4 June 2018. ^ "The Highest-Paid Coaches At The World Cup". Forbes.com. Retrieved 24 October 2018. ^ Olenev, Maxim (28 June 1999). "PORTUGUESE NATIONAL TEAM COACHES". RSSSF. Retrieved 20 June 2007. ^ "Queiroz quits". News24. 12 March 2002. Retrieved 11 October 2017. ^ "Matches of FIFA XI". www.rsssf.com. Retrieved 4 June 2018. ^ Hickman, Niall (24 April 2013). "Steve McClaren: Ruthless Sir Alex Ferguson is the real fighter". Express.co.uk. Retrieved 4 June 2018. ^ "Real sack Queiroz". BBC Sport. 24 May 2004. Retrieved 20 June 2007. ^ "Benfica silent, but Queiroz announcement edges nearer". ESPN Soccernet. 19 May 2006. Retrieved 20 June 2007. ^ "Man Utd pair hit with FA charge". BBC Sport. 2 April 2008. Retrieved 29 July 2008. ^ "Man Utd duo's charge 'not proved'". BBC Sport. 28 May 2008. Retrieved 29 July 2008. ^ "Benfica make United a formal approach for Sir Alex's assistant Carlos Queiroz". London: Daily Mail Sport. 28 March 2008. Retrieved 28 March 2008. ^ "Queiroz hoping for last laugh in Iran adventure". Reuters. 28 April 2014. ^ "Fergie states case for Queiroz". ^ "Ronaldo plots Queiroz exit as Portugal claim to have their man". Daily Mail. London. 4 July 2008. ^ Adamson, Mike (11 July 2008). "Queiroz confirmed as Portugal manager". The Guardian. London: Guardian News and Media. Retrieved 11 July 2008. ^ Pontes, Carlos (12 July 2008). "Queiroz leaves Man United to become Portugal coach". uk.reuters.com. Thompson Reuters. Retrieved 12 July 2008. ^ "Queiroz takes Portugal coach post". BBC Sport. 11 July 2008. Retrieved 11 July 2008. ^ "Ferguson bids farewell to Queiroz, thanking him for rebuilding the team". International Herald Tribune. Sports. Associated Press. 11 July 2008. Retrieved 11 July 2008. ^ "Carlos Queiroz suspended for six months for insulting anti-doping team". The Guardian. Associated Press. 2 September 2009. Retrieved 25 March 2011. ^ "THE CAS ANNULS THE SUSPENSION OF CARLOS QUEIROZ". Court of Arbitration for Sport. 23 March 2011. Archived from the original on 26 March 2011. Retrieved 25 March 2011. ^ "Carlos Queiroz agrees deal to become Iran head coach". Dubai: Soccernet. 4 April 2011. Retrieved 4 April 2011. ^ "5 Iran Players to Watch at the World Cup". ABC News. Archived from the original on 17 April 2014. Retrieved 16 April 2014. ^ "The AFC.com - The Asian Football Confederation". www.the-afc.com. Retrieved 4 June 2018. ^ "Iran 0-0 Nigeria: Super Eagles play out first goalless draw". Mail Online. Retrieved 4 June 2018. ^ "World Cup: Argentina 1-0 Iran". BBC Sport. Retrieved 4 June 2018. ^ Editorial, Reuters. "Queiroz ends contract saga by signing Iran deal". U.K. Retrieved 4 June 2018. ^ a b "Hosts Australia top seeds for 2015 Asian Cup". Reuters. 18 March 2014. Retrieved 18 March 2014. ^ "Queiroz: Iran 'victimised' by sanctions | Goal.com". www.goal.com. Retrieved 4 June 2018. ^ "Iranian fans using social media to defy Asian Cup censorship". ABC News. 23 January 2015. Retrieved 4 June 2018. ^ "Iran v UAE Live Commentary & Result, 19/01/2015, AFC Asian Cup | Goal.com". www.goal.com. Retrieved 4 June 2018. ^ Reuters (23 January 2015). "Iraq beat Iran on penalties to settle classic Asian Cup encounter". the Guardian. Retrieved 4 June 2018. ^ Gorman, Joe (23 January 2015). "Iranian women stand united in protest and hope at Asian Cup". the Guardian. Retrieved 4 June 2018. ^ Gaskin, Lee (24 January 2015). "Former Socceroos blast referee Ben Williams for 'embarrasing' send-off in Iran's Asian Cup loss to Iraq". The Sydney Morning Herald. Retrieved 4 June 2018. ^ "Iran v Chile Live Commentary & Result, 26/03/2015, Friendlies | Goal.com". www.goal.com. Retrieved 4 June 2018. ^ O'Connor, Philip. "Ibra silences raucous Iran fans to give Sweden 3-1 win". Retrieved 4 June 2018. ^ Radio, Sveriges. "Regimkritiska budskap på Friends kan ge böter - Radio Sweden på svenska" (in Swedish). Retrieved 4 June 2018. ^ "Asian draw throws up derbies and drama". FIFA.com. Retrieved 4 June 2018. ^ "U-turn as Carlos Queiroz stays as Iran coach". Retrieved 4 June 2018. ^ Oluwashina Okeleji (23 April 2018). "77 applicants for vacant Cameroon coaching position". BBC Sport. Retrieved 27 April 2018. ^ "ABOLA.PT - Irão - Carlos Queiroz renova contrato até início de 2019". Abola.pt (in Portuguese). ^ "Iran coach Carlos Queiroz has contract extended". Sportstarlive. ^ Sansom, Dan (28 January 2019). "Carlos Queiroz steps down as Iran head coach after Japan defeat". Sky Sports. Retrieved 28 January 2019. ^ "Carlos Queiroz: Colombia role for former Manchester United assistant boss". 7 February 2019 – via www.bbc.co.uk. ^ "Carlos Queiroz: esta es la carrera del nuevo técnico de la selección Colombia". ELESPECTADOR.COM. 6 February 2019. ^ "Latest News Breaking, Pakistan News". www.thenews.com.pk. Retrieved 4 June 2018. ^ "Former United coach Queiroz sparks row by offering to send South Korea rival an Uzbek shirt ahead of Iran World Cup qualifier". Daily Mail. 16 June 2013. Retrieved 30 November 2013. ^ "Match suspensions to be served at the final competition of the FIFA World Cup". FIFA. 24 February 2014. Archived from the original on 9 July 2014. Retrieved 24 February 2014. ^ "Queiroz 'hand gesture' angers Koreans". iOL. 18 June 2013. Retrieved 30 November 2013. ^ Mestre, Rui (15 October 2005). "Portugal – International Results". Rec.Sport.Soccer Statistics Foundation. Retrieved 4 February 2009. ^ Tabeira, Martín (15 October 2005). "South Africa National Team Coaches". Rec.Sport.Soccer Statistics Foundation. Retrieved 4 February 2009. ^ Courtney, Barrie (2 February 2005). "2002 Matches". Rec.Sport.Soccer Statistics Foundation. Retrieved 4 February 2009. ^ At the time of Queiroz's tenure in the United States and Japan, the result of matches could not be a draw. In the event of scores being level at the end of 90 minutes, matches would be decided by extra time and penalties. Wikimedia Commons has media related to Carlos Queiroz.